The total number of Londoners living in poverty has continued to rise over the last few years with the growing population and now stands at around 2.4 million people, according to official government figures. This means 28 per cent of everyone living in the region are in poverty, averaged over three years 2015/16-2017/18. The main poverty measure used is based on current income and is called relative poverty, so people living in households with equivalised income below 60 per cent of the national median (midpoint). The poverty level for 2017/18 equates, for a couple with no children, to around £262 per week, counting all income and deducting taxes and basic housing costs. This is marginally lower than the equivalent figure for the previous year. It is known as relative poverty after housing costs (AHC). However, there are different ways to measure poverty, and this brief analysis outlines some of the key findings on those different measures for London. The poverty level in London has changed little over the two decades that these data have been collected, only varying between 27 and 30 per cent and now stands at 28 per cent, marginally higher than in the years immediately following the recession. The rate in London has been consistently higher than in any other region or part of the UK. It is now six percentage points above the national figure, four percentage points higher than any other region, and ten percentage points above the lowest rate (Northern Ireland). 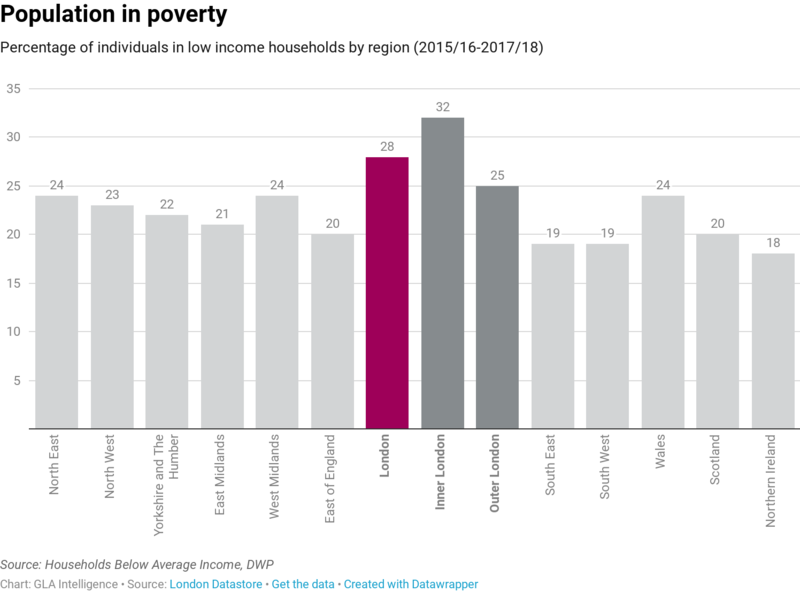 Poverty levels in Inner London remain significantly higher, at 32 per cent, while the Outer London rate has generally been only a little higher than elsewhere and stands at 25 per cent. In contrast, the poverty rate in London, counting all income and deducting taxes but before taking housing costs into account (BHC), had tracked the national rate more closely, falling a little over the longer term and has fallen below the national figure in recent years. Median income in London, at £569 per week (BHC), is higher than in any other region. This compares with £504 nationally. The higher income in London is the result not only of higher wages, but also higher benefit levels relating to housing. A much higher proportion of London households live in private rented housing and their costs are higher, so the amount paid in Housing Benefit and Universal Credit contributes to overall higher levels of income in London before the costs of housing are taken into account. The costs of housing in London are significantly higher than elsewhere, so that the median figure for income AHC is the same as the figure for the whole of England at £436 per week. Nationally, while the overall poverty rate using the AHC basis has remained fairly stable for more than a decade, the number of people in poverty has increased over the same period, up around a million people to 14 million, the rates in London have fluctuated, but the numbers for London (which are three year averages) have risen steadily with the increasing population so the latest figures show that one in six of all people in the UK in poverty live in London. Poverty rates vary across the population according to different attributes. Children are more likely to be living in poverty than adults overall, with 37 per cent of London’s children (around 700,000) in poverty. These figures have been stable over recent years, remaining at their lowest level since the data series began in 1994/5. At the same time, the rates have been increasing nationally, so that the comparable (three year average for 2015/16-2017/18) figure for the UK is 30 per cent AHC. Both the London and national rates using the BHC measure have risen by one percentage point over the previous year’s figures to 19 per cent for London and 20 per cent for UK. After housing costs, the percentage of Inner London children living in poverty has increased further, up to 44 per cent, while the rate in Outer London has remained unchanged at 34 per cent. This is still well above the UK figure, but the rate for the North East of England has risen rapidly and now stands at 35 per cent. For some children, their experience of poverty may be relatively short term, but most children in poverty stay in poverty. The percentage of all children in London counted as being in persistent poverty has shown a clear increase, up to 29 per cent AHC or 15 per cent BHC. That means that 80 per cent of children in poverty are counted as being in persistent poverty. Most children in poverty live in a working household. This does not mean that children in workless households are not in poverty – children in households with no one in work are more likely to be in poverty than those in working households. However, there are relatively few workless households with children and the overwhelming majority of children live in working households, so more than two in three children in poverty across the UK live in working households. Material deprivation – when people cannot afford what are commonly regarded as essentials for life in Britain – affects many London children. 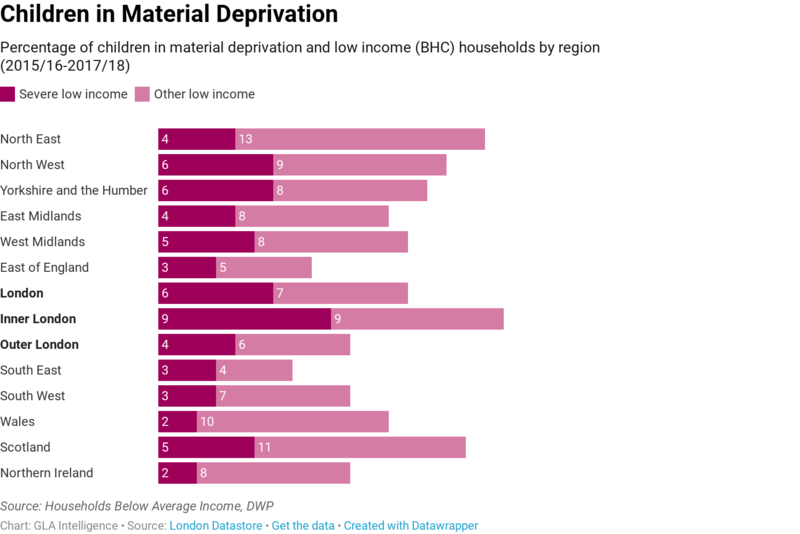 Low income (BHC) and material deprivation affects one in eight, while the level of severe low income and material deprivation is lower, at around one in sixteen, this has risen over the previous figures. This nevertheless translates to over 100,000 of the capital’s children living in families with income below half of that of the average family and going without the normal necessities. There are similar numbers in Inner and Outer London, though the rates for Inner London are around double those for Outer London. Poverty among working age people in the UK has shown relatively little change over twenty years. 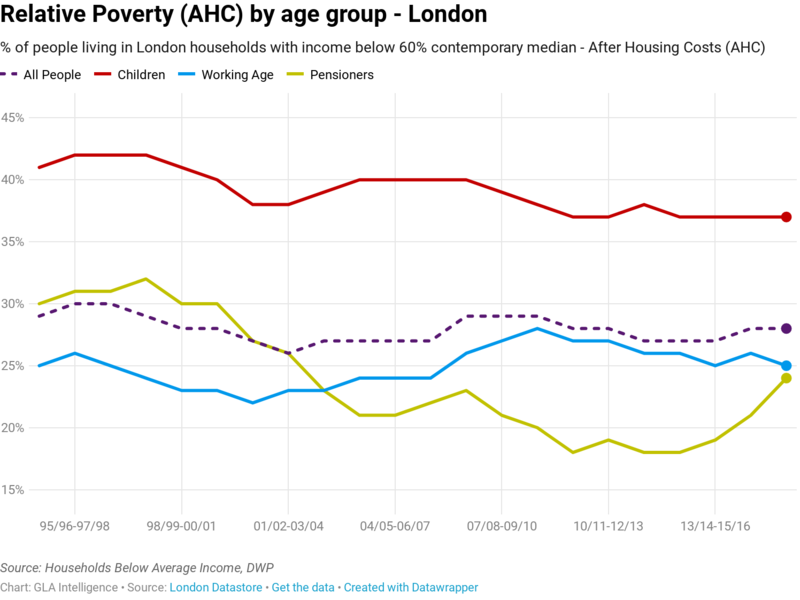 In London, the poverty rates for this age group have hovered around one in four, which is well above the national figure. This represents 1.4 million working age Londoners living in relative poverty after taking their housing costs into account. Around 60 per cent of working age Londoners in poverty might be classified as in persistent poverty. High housing costs also make London pensioners more likely to be in poverty. In contrast, in the rest of the UK, pensioners are more likely to be counted as in poverty using the before housing costs measure than after housing costs are taken into account. Despite the fact that many pensioners in London and elsewhere own their homes outright, and thus have reduced housing costs, renting remains more common in London than in many other areas for this age group. Poverty in London among pensioners has risen sharply in recent years on both measures. Almost one in four people over retirement age living in London has income after housing costs below the poverty line. More than half of these (one in eight of all London’s pensioners) are classified as in persistent poverty, having been counted as living in poverty in at least three years out of the last four. 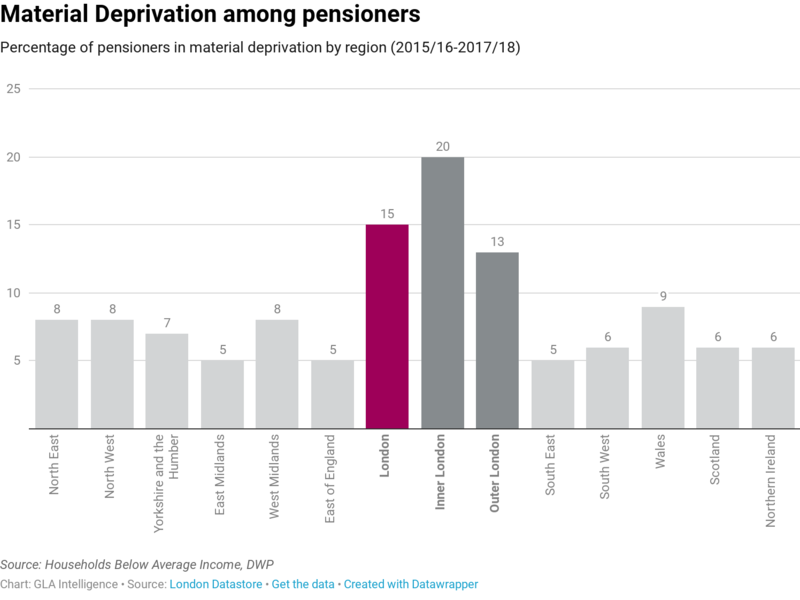 Material deprivation among older Londoners is much higher than in other parts of the UK, with 15 per cent of all pensioners in London unable to afford or being prevented by health or disability issues or social isolation from having such necessities as a damp-free home, access to a telephone or having hair cut regularly. This rises to 20 per cent in Inner London. 1Adjusted for household size and composition to give a measure of potential living standard comparable across different household types. All data in this analysis are derived from published DWP Family Resources Survey, Households Below Average Income series or Income Dynamics.